Our ANY LAB TEST NOW customers desire a level of confidentiality; however, want the convenience and empowerment to be in control of their own health records. ANY LAB TEST NOW®, the first direct access lab testing services business with more than 150 franchise locations across the U.S., is announcing that each of its store locations are now listed as an STD testing center on Hula, a mobile app that allows users to find an STD test center, get results online and share a verified STD status. Hula’s mission is to provide access to information that users need to make well-informed sexual health decisions. It is a free way to find testing centers, allowing users to provide reviews and a mobile personal health record for securely store and share results. ANY LAB TEST NOW will aid in the achievement of Hula’s goal by providing STD testing services at an affordable price, and in a fast, convenient manner. 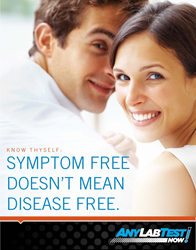 To learn more about ANY LAB TEST NOW, visit http://www.anylabtestnow.com, and Hula at http://www.gethula.com. Founded in 1992, ANY LAB TEST NOW is a franchise direct access lab testing company that provides thousands of standard lab tests to consumers and businesses in a professional, convenient and cost-effective, transparent manner. With over 150 facilities around the U.S., ANY LAB TEST NOW offers a variety of affordable and confidential lab tests to consumers and businesses including general health and wellness panels, pregnancy, HIV/STD, drug, paternity and many more tests. To learn more about ANY LAB TEST NOW, visit our website or like us on Facebook.